At Mulberrys Garment Care, we know that there are many challenges to running a business. For both employees and employers, one of the hardest parts of being in the workforce is salary negotiation. We conducted a survey on common attitudes about salary negotiation, and break down the data below to help combat your salary negotiation fears. There are many factors that go into choosing a field to go into, especially considering the fact that your career can occupy over 40 hours a week, and could span several decades in length. One of the things that many take into consideration when choosing a profession is the pay. In fact, 30.3% of people surveyed said that the starting salary for positions in their chosen field was an important aspect when they were considering what profession to go into. 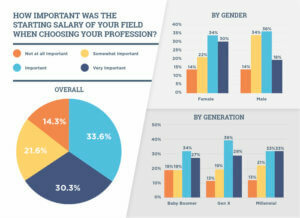 This number varies when gender and generation are taken into account, with millenials expressing the highest amounts of deliberation about salary when deciding on a field. Despite starting salary being a major factor for many in the decision to enter into a profession, 52.8% of people report feeling underpaid. 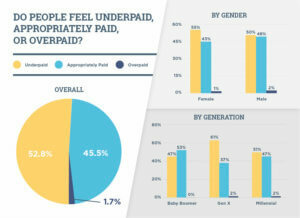 Members of Generation X reported feeling underpaid in the highest rates, at 61%, while Baby Boomers are the only generation to consider themselves adequately paid, at 53%. 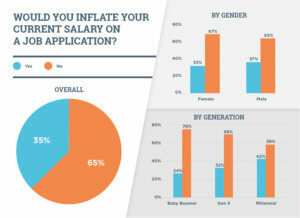 Even though the majority of respondents reported feeling that they were underpaid, most also said that they would not inflate their current salary on a job application. Only 35% of those surveyed would inflate their salaries, with Millenials responding that they would engage in the practice at the highest rate: 42%. While salaries are a huge factor for consideration when choosing a career and many feel as though they are underpaid, how do people approach salary negotiation when given a chance? It is a well-researched fact that women have a harder time negotiating salary than men, and our study was no exception. 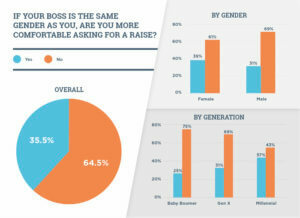 21% of women feel “very uncomfortable” asking for a raise, while only 12% of men expressed the same discomfort. In fact, only Generation X indicated a higher level of ease when asking for a raise. Baby Boomers, by comparison, reported feeling “somewhat uncomfortable” and “very uncomfortable” at the highest rates, at 41% and 19% respectively. Everyone prepares to negotiate their salary differently, but there were some commonalities. Most preferred to compile their accomplishments to present as evidence for why they are deserving of a raise. 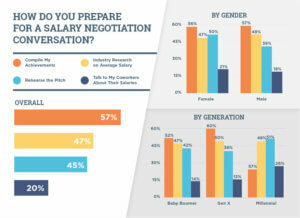 However, 47% of respondents choose to focus on industry standards for salary, while 45% prep by rehearsing their pitch. There are many expectations that people have when asking for a raise, and overall, there are many different beliefs about what salary negotiations should be. 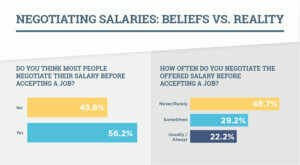 While 56.2% of people believe that most negotiate their salary before accepting a job, 48.7% don’t negotiate the offered salary before accepting a position. 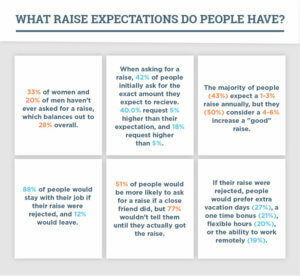 In fact, 28% of people have never asked for a raise at all, even though the majority of people surveyed expect a modest raise yearly. Salary negotiation is one of the trickiest parts of any job. Hopefully, this guide will give you the confidence to know that you’re not alone in your uneasiness around asking for a raise. If you have any tips or helpful hints on asking for and securing a raise, leave them in the comments below!